Glacier scientists trying to understand more about how the huge bodies of ice behave have made use of innovative wireless "electronic pebbles" to help. It is the first time such sensors have been put in glaciers to collect information and transmit it instantly over the net to computers elsewhere. The robust sensors have been made by a UK team to improve hi-tech monitoring techniques in hostile places. Dr Jane Hart, from the Glacsweb team, said it was a major hi-tech advance. "It is the beginning of huge technological advance in environmental monitoring," she told BBC News Online. "What this project does is try to use cutting-edge technology to measure properties of the glacier. We haven't been able to do that before." The team, based at the University of Southampton, is leading the way in using intelligent and networked sensor technology. With growing concern about global warming and climate change, Dr Hart explained, it was vital that such monitoring took place. As global temperatures rise, glaciers will melt and the water will flow into the sea, raising sea levels and changing ocean circulation patterns. But this is a slow, gradual process and the rate of glacial movement can depend on the nature of the ground upon which the block of ice is resting. "It is important for us to monitor the behaviour of the glacier to understand how it is behaving the way it is," Dr Hart explained. "It has made an amazing difference, because for the first time we can really track what is going on in the glacier." The low-powered pebble probes are placed near the bottom of the glaciers and move with the ice, recording temperature, pressure, speed and the makeup of the glacier's sediment. They are positioned at the base at a depth of about 60-90m after a hot water drill, like a powerful carwash, has drilled a hole deep enough. "They send back their signals to the surface by radio, and these are picked up on a surface base station, which also records temperature and velocity. "It has a webcam and snow meter, and it is able to track the position of these probes we have put in," said Dr Hart. The base station then sends the information by radio to the monitoring team's campsite. That data is then fed into a computer and put online to make it available instantly to glaciologists around the world. 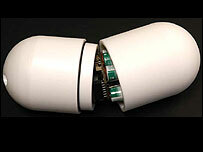 At 14cm long, the tough polyester shells housing the probes are designed to be as much like a pebble as possible. That way, they match the way sediment that gets caught up at the bottom of glaciers flows with the ice and meltwater. Shrinking them to such a small size would have been unthinkable two years ago, said Dr Hart. The data, which is collected six times a day and transmitted once a day, can also be sent back via SMS messages to the computer. Over the winter, both SMS and radio signals were used to test the probes. 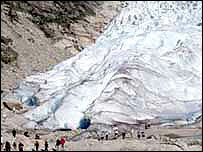 Previous techniques for keeping track of this kind of ice movement have been problematic because glaciers are usually in hostile environments. Problems with technology which functions well in such places, as well as the ability for humans to withstand the environment for long periods of time, have been a hindrance, too. "This is the first time this has even been attempted. They have been used before, but using sensors with wires, which did not move in the right way," said Dr Hart. The first generation of sensors were tested last year in Norway's Briksdalsbreen Glacier, one of the fastest-flowing bodies of ice in the world. The team is due to return to the glacier in July to insert about 15 to 20 improved probes which work on a better frequency and are smaller. Dr Hart is excited about their potential use in other hazardous environments, because the field of networked "ad hoc sensors" is a constantly developing one. Being "ad hoc" means multiple sensors are able to communicate with each other. The next challenges are to work out how to cope with large-scale networks of 200 or 500 sensors. "It is going to be absolutely fantastic. Up until now it has been difficult to do sensitively enough for people to respond to the results." The Glacsweb project is part of the Department for Trade and Industry-funded Next Wave Technologies and Markets programme. It is an attempt to ensure smart technologies are increasingly integrated into everyday lives and scientific monitoring. The Glacsweb team is just one of the projects involved with environmental monitoring.